This Basilica has been extended at the back of the original church and it has now two floors, where services are held everyday. The Gothic style of architecture is a unique feature of the Church. The church itself is an imposing building with inspiring architecture. The Museum situated apposite to the Basilica has a very rich variety of exhibits that tell of the numerous miracles that have taken place, after praying in this church. The precious offerings made by the devotees are on display here. Biblical incidents are depicted on both sidewalls. 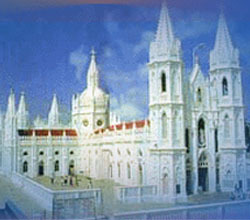 Timings to visit the church: 6.30 a.m to 8.00 p.m.
Festivals are celebrated here with pomp and gaiety. Every year on August 29th the feast of Our Lady commences with the hoisting of the flag. The 10 -day festival ends on the 8th September and the flag is lowered. The pilgrims who come here also follow the Hindu tradition of tonsuring their heads as an offering, and also perform ear-boring ceremony. This is a religious centre where Hindu, Muslims and Christian from all over India congregate in large numbers and worship in harmony.